BERLIN (IDN) - Two and a half years after President Barack Obama pleaded for a nuke-free world, the U.S. nuclear-weapons policy and the nuclear posture in support of that goal appear to be in danger of stalling, experts say. In fact, despite his pledge for what arms-control advocates call 'global zero', Obama is spending more than his predecessor President George W. Bush did to upgrade and modernize arms during his two terms in office (January 1981-January 1989), those knowledgeable about arms policy say. They refer to a 10-year $85 billion nuclear weapons complex spending plan the administration announced in November 2010 in a compromise to secure Senate's endorsement for the New START (Strategic Arms Reduction Treaty) with Russia. The treaty, formally called Measures for the Further Reduction and Limitation of Strategic Offensive Arms, was signed on April 8, 2010 in Prague. It entered into force on February 5, 2011 after ratification, and is expected to last at least until 2021. New START requires the U.S. and Russia to each reduce deployment of strategic nuclear warheads to 1,550, down from a cap of 2,200 mandated by 2012 under an older treaty. It also limits the number of fielded warhead delivery platforms to 700, with an additional 100 strategic systems permitted in reserve. That same April 2010, when the New START was signed, Obama hosted a major nonproliferation summit in Washington, where 47 countries made voluntary commitments to work to safeguard loose nuclear material. But that "nuclear spring," as the White House dubbed it, may come to signify the apex of arms-control advocates' hopes, writes Zachary Roth in the Atlantic Magazine on September 29, 2011. "Thanks to wariness on the part of the Russians, and ideological opposition to arms control from much of the Republican Party, further U.S.-Russia agreements look to be a long way off," he adds. "There's a lot of skepticism [among U.S. lawmakers], even about further reductions, let alone zero," says James Acton, a senior associate in the Nuclear Policy Program at the Carnegie Endowment for Peace. And since the U.S. won't disarm unilaterally, that bodes poorly for the chances of additional cuts. Adds Acton: "I'm deeply pessimistic about the prospects for further reductions." At the same time, the expert endorsed the decade-long nuclear weapons spending plan. "I think it actually helps you get to zero," he said. "It makes a world of low numbers a safer place, because it's harder for Russia to win an arms race." Arms Control Association head Daryl Kimball, though, said the planned nuclear weapons spending increases are "incongruous" with Obama's stated disarmament goal, reported the Global Security Newswire (GSN). This scepticism is shared by Hans Kristensen, director of the Nuclear Information Project with the Federation of American Scientists (FAS), a think tank based in Washington that monitors U.S. nuclear policy on ethical grounds. In an analysis jointly with Robert S. Norris, Kristensen says: "There is concern over whether Obama's goals can be realized within the enduring bureaucracies that have a stake in the status quo." They are of the view that "a radical break" is necessary to set the U.S. "on a new path capable of realizing deep reductions in and possible elimination of nuclear weapons." That break, they argue, must be the abandonment of "counterforce," the ruling paradigm that focuses on eliminating an enemy's nuclear weapons, infrastructure and war-making abilities and that has been core of every war plan of the past five decades. President Obama's aspiration has also received resistance from U.S. armed forces and nonmilitary Defence Department elements reliant on significant nuclear weapons operations; such insiders stand to benefit from defending the present arsenal size, a number of experts said. "Are we actually going to see a world without nuclear weapons?" former Defense Secretary James Schlesinger asked a 2010 "Deterrence Symposium" organized by the U.S. Strategic Command. "This is the vision of many people, and I remind you that the dividing line between vision and hallucination is never very clear." In 2011, event attendees appeared more assured that the United States would remain heavily dependent on its nuclear deterrent, the Atlantic reported. The nuclear arsenal represents "the greatest tool of self-defence that the world has ever seen," said Keir Lieber, a professor with Georgetown University's School of Foreign Service. Strategic Command head Gen. Robert Kehler and Defence Undersecretary James Miller, respectively the top armed forces and nonmilitary nuclear weapons officials, each stressed Obama's remark in the 2009 address that he might not live to see the achievement of global nuclear disarmament. "The goal (of zero) remains," Miller said, unprompted, according to reports. The administration's 2010 Nuclear Posture Review (NPR) acknowledged the goal, but it neither adopted a no-first-use policy nor called for eliminating a leg of the "triad" of land-, air- and sea-based nuclear-weapon delivery systems, steps some disarmament advocates had sought, according to GSN. The report was "a tremendously good-news story" for longtime nuclear deterrence policies, then-Strategic Command head Gen. Kevin Chilton said, noting his personnel had been "intimately involved" in its development. Former Defence Secretary Schlesinger said, "It is something of a gift that the NPR turned out to be as strong as it is." Obama administration officials defended their avoidance of more ambitious arms-control steps. "A very bold, overly aggressive arms-control agenda is one the Russians are not prepared for, is one our allies are not prepared for, and therefore isn't practical," one administration official said, describing Obama's nuclear policy as a "balanced approach" intended to "take practical steps toward the long-term goal, while ensuring that deterrence remains effective." In addition, a potential Republican Party-dominated Senate might complicate the administration's campaign to secure ratification of the Comprehensive Test Ban Treaty. Still, backers of nuclear disarmament suggested Obama's ambition would benefit efforts to eliminate nuclear weapons in the long term. "The most recent wave in support of zero has crested, leaving behind an altered nuclear landscape," Stimson Center nuclear analyst Michael Krepon wrote. "Zero will always be in the picture now." 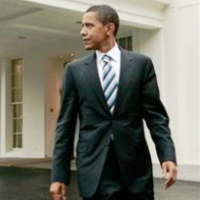 "Obama's high-profile endorsement of . . . 'global zero' was a hugely significant step for a U.S. president to take," says Roth. Just ten weeks after Inauguration Day in 2009, President Obama used his first overseas trip in office to announce his intention to rid the world of nuclear weapons, the writer recalls, adding: The U.S. "must ignore the voices who tell us that the world cannot change. We have to insist: Yes we can," he told a cheering crowd of 20,000 in Prague's Hradcany Square, "rhetorically linking the no-nukes push to the sky's-the-limit idealism that had electrified supporters" during his presidential campaign. "But since then, he's been hit with some jarring reminders of just what an uphill climb that journey to zero will be. . . . Obama's effort to initiate considerable reduction of the U.S.'s own massive atomic arsenal with a view to ushering in a nuclear-weapons-free world has indeed proceeded "far more slowly than expected," writes Roth. "He's clearly accomplished much less than had been hoped," says Barry Blechman, a veteran weapons-policy expert who has served on the Pentagon's Defence Policy Board and as a top arms-control official. "Advocates of major arms reductions say they always knew progress would be slow. But . . . nuclear-weapons policy has become yet another area where the heady optimism of the administration's early days has largely evaporated," says Roth. "And Obama's bold push for a nuclear-free world – and an American nuclear posture in support of that goal -- looks to be in danger of stalling." However, in pleading for a "global zero", the U.S. president was not just paying lip service to some "pie-in-the-sky dream" of his liberal base. The fact is that since well before the Prague speech, the U.S. nuclear weapons program had been facing "something of an existential crisis."